Safari mini-bus (Kenya) and 4-wheel drive safari vehicle (Tanzania), between destinations and for game drives, with pop-up roof for easy game viewing and photography. We limit each vehicle to a maximum of six people, ensuring you’ll always have a window seat. Today, board a plane for the quick flight to Nairobi. After a short break, drive to AMBOSELI NATIONAL PARK, best known for spectacular views of Mount Kilimanjaro, the highest mountain in Africa at some 19,341 feet. Embark on an AFTERNOON GAME DRIVE before settling in at your lodge. MORNING & AFTERNOON GAME DRIVES are included today. Amboseli affords you a great opportunity to get close to the mighty elephant. You might also spot Cape buffalo, zebra, wild dog, and more. This morning, cross the border into Tanzania. After lunch in Arusha, proceed to your camp and enjoy some leisure time prior to dinner. Embark on a MORNING GAME DRIVE in LAKE MANYARA NATIONAL PARK. This small park is ecologically diverse, with groundwater forests, grassy plains, and alkaline Lake Manyara itself. Watch for elephant, Cape buffalo, giraffe, and more. The park is also home to the world’s largest concentration of baboons. Then, journey to your lodge and enjoy some time at leisure this afternoon. Descend into the crater for a FULL-DAY GAME DRIVE. Ngorongoro Crater is technically a caldera—the world’s largest unflooded one, in fact, at more than 2,000 feet deep with a floor covering over 102 square miles. Game viewing here is fantastic, as most of the animals stay in this area year round. You can see lion, Cape buffalo, hippo, elephant, and flamingo. This is also your best chance to see the rare black rhinoceros. A picnic lunch will be served in the crater. 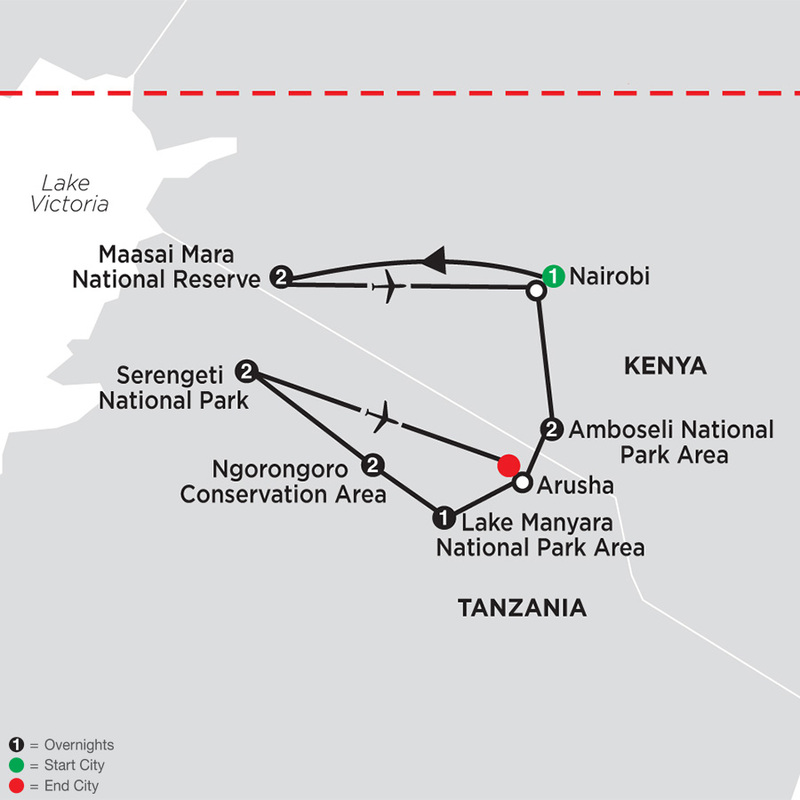 Today, drive to SERENGETI NATIONAL PARK, Tanzania’s largest and most famous park. Home to the annual Great Migration of wildebeest and zebra, generally between late November and July, it attracts visitors from around the world and is great for game viewing year round. Enjoy lunch at your lodge before an afternoon GAME DRIVE. The Serengeti covers an area of roughly 5,700 square miles, so it is no surprise that the name comes from the Maasai word siringit, meaning “endless plains.” Continue your exploration during MORNING & AFTERNOON GAME DRIVES. You have the chance to see the big cats—lion, leopard, and cheetah—as well as an abundance of other animals, including the Nile crocodile, giraffe, gazelle, and eland. This morning, fly back to Arusha, where your tour ends. We have secured a day room at the Mount Meru Hotel for you to use prior to your homebound flight. Book homebound flights after 5 pm.